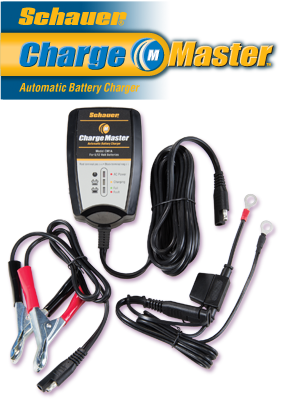 One amp fully automatic battery charger for 6/12 volt batteries. green – charged switched to float mode. Fully automatic, can be left on the battery indefinitely. Easily keeps batteries charged in stored vehicles. Ideal for cars, motorcycles, riding mowers, snowmobiles, etc. Charges, maintains, & conditions batteries. Reverse polarity protected. Requires minimum of 5 volts from battery to start charger. Molded plastic case plugs into outlet. Ten foot long AC & DC cordset includes quick change battery clips and ring terminals.